Mark your calendars! 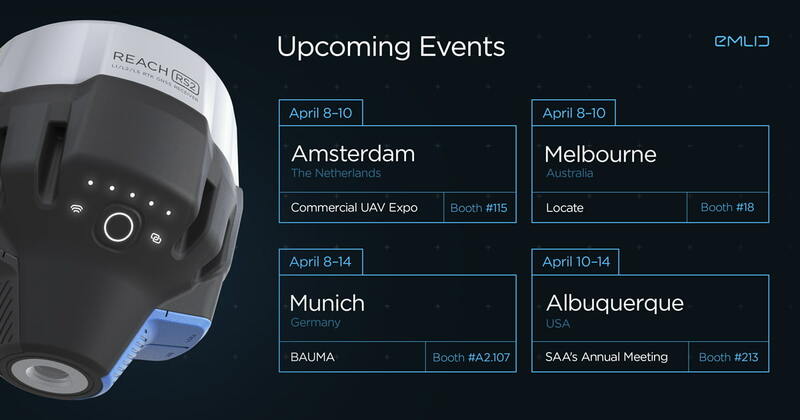 In April our team is heading to Melbourne, Amsterdam, Munich, and Albuquerque to showcase Reach RS2. This is the first time when Reach RS2 is shown to the public. Use the chance to talk to Emlid team and be the first to try out our new RTK GNSS receiver. Locate is a premier geospatial conference and expo in Australia. Emlid is exhibiting together with Mangoesmapping–authorized dealer of Reach in Australia. You can find Emlid at booth #18. Also, don’t miss the panel discussion with Igor Vereninov, CEO of Emlid, on the first day of the conference! Europe’s leading conference and exhibition for commercial drone pilots. The event will be taking place on April 8–10 in Amsterdam. Find us at #213 and pre-order Reach RS2 from our European dealer General Laser with a special price right at the booth! A week-long BAUMA is the world’s leading trade fair for the construction and mining industries. We are super excited to be part of it in 2019! We would love to see everyone at A2.107 on April 8–14. SAA’s Conference brings together the global archaeological community. Visit #214 to learn how Reach RS+ and Reach RS2 helps to plot archeological sites and enables centimeter accuracy for drone mapping and geophysical surveying at the excavation places. If you’d like to arrange a meeting at any of the above Expos, please email us at info@emlid.com or use the contact form! We have more events coming this season, check the events page to see where to find us next. Austin, Texas would welcome you!